The perfect match between grapes and rooibos! Enjoy this cool rooibos drink, a plant from South Africa. The natural sugar of the grapes and apples adds sweetness to this beverage. 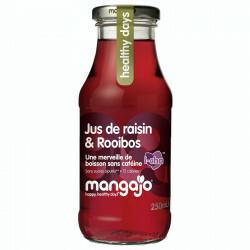 This drink has no artificial flavours, preservatives and no added sugar. Discover Mangajo, refreshing and thirst-quenching drinks. Very trendy, our new iced teas will be perfect for chill out breaks. 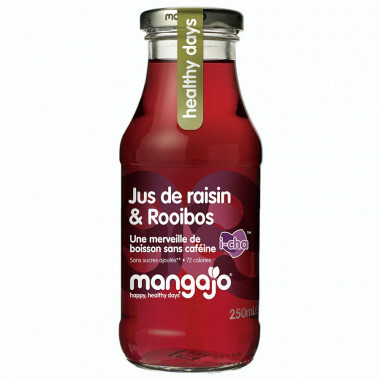 Mangajo offers a range of natural detox drinks, no artificial colours, no preservatives and no added sugar. These drinks are made of green tea infusions or rooibos. Naturally sugary, they also have exotic fruits often considered as antioxidant "Super food". Ingredients: water, sugar obtained from 9% apple juice*, fruit juice (2% grape), 0.2% rooibos infusion, acidity corrector: citric acid, natural colour (carrot, hibiscus), natural flavouring. *from concentrate. Best use before: see date on bottle. Store in a cool area, after opening, keep refregerated and consume it within three days.